Gumbo is the Swahili word for okra -- a podded green vegetable that came to America from Africa during the slave trade. As a plant derived from the hollyhock family, it grows annually in warm weather. Immature okra pods are used traditionally in stews, soups and canning, and in boiled and fried vegetable dishes, particularly in Southern cuisine. Okra has a gummy texture, tastes somewhat similar to eggplant, and it can add nutritional benefits to your diet if you use it properly. Okra is a "power house of valuable nutrients," according to the University of Illinois Extension program. It contains no fat or cholesterol, rich amounts of soluble fiber, which promotes healthy cholesterol levels, and insoluble fiber, which promotes a healthy digestive tract, lowering your risk for colorectal cancer. Okra is also high in folic acid and vitamin B-6, which plays an important role in your metabolism and physical development, vitamin A, which promotes healthy tissues and eyes, and vitamin C, which supports strong immune system function. 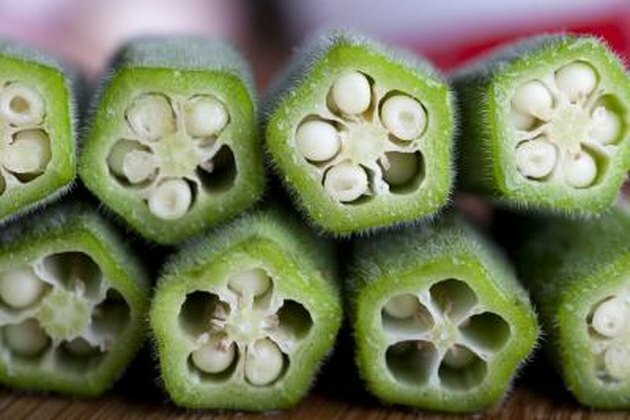 Okra also contains essential minerals, including potassium, magnesium and iron. One half-cup of okra contains 25 calories, 2 g of fiber and 1.52 g of protein. Like most vegetables, okra in its natural state is nutritious and unlikely to cause adverse effects. If you're prone to oxalate kidney stones, however, eating okra in excess may worsen you symptoms, according to the University of Maryland Medical Center. Although not as rich in oxalates as other foods, such as lamb, chocolate and spinach, okra does contain moderate amounts. The way you prepare okra also influences its nutritional value. A 3-oz serving of fried okra, for example, contains 210 calories, 10 percent of the daily recommended allowance of saturated fat and nearly 60 percent of the RDA of cholesterol. Preparing okra with butter, margarine, lard or oil has similar effects. Maintaining modest saturated fat and cholesterol intake is important for preventing and reducing the effects of high cholesterol, high blood pressure and heart disease. Over-cooking okra may rid the vegetable of some of its nutrients. For a nutritious alternative to fried okra, the American Heart Association recommends tossing 20 oz frozen, sliced okra in a mixture of 2 cups corn meal, 1/2 tsp pepper and 1/2 tsp salt, allowing it to sit for 10 minutes, then baking it in a foil-lined pan with canola oil cooking spray for 40 minutes at 475 degrees F. Flip and spray okra with additional cooking spray at least once while it's baking. Okra can also be used to add flavor, thickness and nutrients to gumbo and dishes containing tomatoes, corn, onions and shellfish. Simple preparation techniques include steaming, baking and broiling fresh or frozen okra in whole or sliced form. Healthy seasoning options include lemon juice, natural herbs, chopped garlic and low-sodium soy sauce. Freezing okra is the best way to preserve it, according to the University of Illinois Extension program. Freezing also helps to retain its nutrients, so freeze okra in its prime state -- in other words, fresh, colorful okra that hasn't softened or begun to turn brown. For enhanced success, place okra in boiling water for four minutes, then in cold water for five minutes. Then, drain your okra and and store it in your freezer in air-tight plastic bags. This process, known as blanching, stops enzyme actions in the plant, which can rid okra of flavor, color and texture.